Do you have a tooth that throbs every time you eat or drink hot or cold foods or beverages? If so, you may need a root canal. The tricky thing is you won’t always know if you need a root canal. Sometimes there are no symptoms at all. 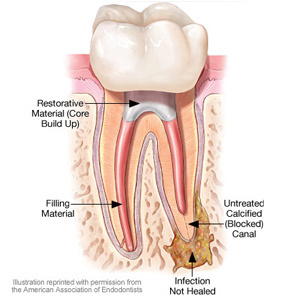 Your dentists at Dental Wellness of Lexington, in Lexington, Kentucky Dr. Anthony Feck, Dr. Maxie Combs, and Dr. Carol Wilson want to share some of the signs you may need a root canal. You may need a root canal because of deep dental decay, dental trauma from an accident or injury, or just natural causes. The truth is only your dentist can tell for sure if you need a root canal. By taking state-of-the-art digital x-rays and performing temperature and vitality testing, your dentist will determine the best course of action to eliminate pain and preserve your beautiful smile. If you think you might need a root canal, don’t wait. Spare yourself from tooth pain by calling your dentists at Dental Wellness of Lexington, in Lexington, Kentucky. They are experts at keeping your smile healthy, so call today!